Lebanon has a long and varied history, but schools steer clear of teaching about the country's recent past, as the BBC's Natalia Antelava found out when she visited a school in the capital, Beirut. Kristina and Ali sit side by side in their history class and together they learn about the Phoenicians and the Romans, the Greeks and the Ottomans. But when it comes to Lebanon's more recent, turbulent past - their school teaches them nothing. Modern history is not part of the curriculum in Lebanon and, just like thousands of other children, Kristina and Ali - who are both 14 - turn to their families for answers their history teacher cannot provide. "When I want to know something, I ask my dad," Ali says. Kristina, who comes from a different religious background, says she does the same. Their history teacher does not like the arrangement but, in a country split along sectarian lines, she prefers to stick to it. "Sometimes students ask about more recent events," she says, "but it's difficult to explain things to them without getting into sectarian divisions." In Lebanon, children are not taught modern history because adults cannot agree on it. Even the country's ancient history is a thorny issue here. There are dozens of the government-approved history textbooks that offer different takes on the past. Depending on their religious affiliation, schools can choose books that describe the French as colonialists or liberators and portray the Ottomans as conquerors or as administrators. While Christian schools tend to focus more heavily on the Phoenician past, which the Christian community here identifies with, the Muslim schools teach more about Lebanon under the Arabs. 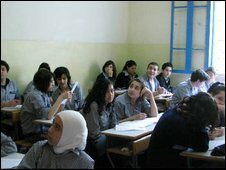 But when it comes to contemporary times, in schools across Lebanon history simply comes to a halt. "It's a real problem," says Ohaness Goktchian, professor of political science at the American University in Beirut. "We are raising another generation of children who identify themselves with their communities and not their nation. "History is what unites people. Without history we can't have unity." Back in the 1970s, that lack of national unity combined with the complex geopolitics of the Middle East to erupt in a lengthy civil war. For 15 years blood was shed across Lebanon in the name of politics and religion. The war forced millions out of the country, killed almost 200,000 and left Beirut in ruins. Today, much of Beirut has been rebuilt and memories of the violence have faded. But the legacy of the war - the bitterness and the deep divisions - continue to live on, and opinions are as divided as they were in the 1970s. Lebanese historian Antoine Messarra believes the war will haunt Lebanon until its people agree on one, unified, version of history. "We are the people without collective memory," he says. "But for the sake of the future, we need to create one narrative that all of us will be able to believe in." In the late 1990s, Mr Messara and his colleagues from across Lebanon's religious communities came together in an attempt to create some such historical narrative. The government committee that they formed was based on one of the recommendations of the Taif Peace Agreement, which ended the civil war and which called, among other things, for the creation of a unified history curriculum. 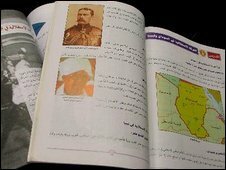 Unlike the politicians, historians managed to get along and after three years of work they presented the ministry of education with a curriculum they deemed suitable for Lebanese of all backgrounds. But they turned out to be wrong. The book never saw the light of day because, at the very last moment, the Minister of Education at the time did not agree with one of the historical interpretations and refused to allow the textbook into circulation. "We came very close and we tried very hard but, at the end of the day, politics won," says Mr Messara. Now the Lebanese are trying again. The country has a new unity government, created in 2007 after sectarian clashes gripped Beirut, putting Lebanon on the verge of another civil war. But then a peace deal was signed, forcing the rival Lebanese politicians back to the negotiating table, and bringing the united history textbook back on to their agenda. The country's new minister of education says she is determined to introduce the new history curriculum to all schools. But political science professor Ohannes Goktchian is sceptical. "This new unity government has brought a period of relative calm, but these are the same politicians who fought each other in the past," he says. "In Lebanon we don't share values and traditions. And we have an education system which contributes to the divisions among us." Back in Ali and Kristina's school, in Beirut's vibrant Hamra district, opinions are also divided. Kristina says she would like to see modern history taught in schools. "I think it could help us answer many questions that we have, and it would be very good for us," she says. Ali listens and shakes his head in disagreement. "I think if we start talking about modern history in school, the hatred and the problems will come out," he says.